Please see the AsiArctic Website for much more information. Arctic Review on Law and Politics, Vol 10, 2019, pp. 24-52. The Polar Journal, published online 26.10.2016, 16 p.
In Elena Conde and Sara Iglesias Sánchez (eds), Global Challenges in the Arctic Region: Sovereignty, Environment and Geopolitical Balance. London, Routledge, 2017, pp. 170-195. In Vijay Sakhuja and Kapil Narula (eds), Asia in the Arctic. Singapore, Springer, 2016, pp. 3-13. 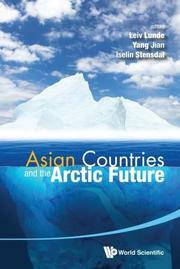 In Leiv Lunde, Yang Jian and Iselin Stensdal (eds), Asian Countries and the Arctic Future. Singapore, World Scientific Publishing, 2016, pp. 265-280. Institutional complexity in Arctic Governance: Curse or blessing? In L.C. Jensen and G. Hønneland (eds), Handbook of the Politics of the Arctic. Cheltenham, Edward Elgar, 2015, pp. 328-351. In R. Tamnes and K. Offerdal (eds), Geopolitics in the Arctic. Regional Dynamics in a Global World. London, Routledge, 2014, pp. 121-146. Strategic Analysis, Vol 38, No 6, 2014, pp. 770-783. Strategic Analysis, Vol 37, No 4, 2013, pp. 474-479. CSIS - Reconnecting Asia. 18.4.2017. In J.-F. Morin and A. Orsini (eds), Essential Concepts of Global Environmental Governance. London, Routledge, 2015, pp. 7-9. FNI Report 6/2013. Lysaker, FNI, 2013, 39 p.